Is it Safe Now to Admit Jimmy Carter Was Right? 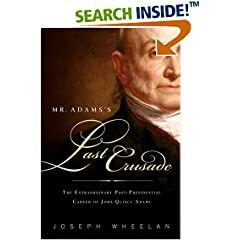 Mr. Wheelan is the author of four books on American presidents and American history, the most recent published in January, Mr. Adams's Last Crusade: John Quincy Adams's Extraordinary Post-Presidential Life in Congress. Misunderstood, mocked, and maligned, the 39th president (1977-81) will forever be associated with the Iranian hostage crisis and the botched rescue attempt; the human rights-inspired Olympic boycott and grain embargo; inflation; the infamous rabbit attack; and, above all, skyrocketing fuel prices. We admirers have long endured ridicule whenever we dared to defend Carter’s prescient plan for reducing U.S. dependence on oil. But today, after all the abuse and scorn heaped on Jimmy Carter and his supporters, we find ourselves paying more than $4 a gallon at the pump to fill our hulking gas guzzlers. It turns out that Carter was right after all. Jimmy Carter was right in exhorting Americans to turn down their thermostats, even if he did look nerdy in a cardigan while urging us to do so. In his July 1979 speech, he was right when he said, “I am tonight setting a clear goal for the energy policy of the United States. Beginning this moment, this nation will never use more foreign oil than we did in 1977 — never.” That worthy goal quickly went by the board. He was right to encourage fuel conservation by proposing a 50-cents-per-gallon tax on gasoline and a fee on imported oil — in effect, a floor for fuel prices. Invoking the pioneering spirit of the 1960s’ moon mission, he was right to recommend a tax on windfall oil profits to finance a crash program to develop affordable synthetic fuels. Jimmy Carter was correct, too, in setting a goal of obtaining 20 percent of our energy from solar power by the year 2000. We balked, and his energy program, which was new and demanding, shriveled up and died. When oil prices began declining in the 1980s, the justification for change vanished altogether. The Reagan administration junked the proposed 1995 mileage standard and the rest of the Carter agenda. Amazingly, amid today’s record gasoline prices, Congress even now doesn’t quite get it. It was only last December that Congress approved new mileage standards, the first in 32 years. If they stand, the present fleet standard of 27.5 mpg will rise to 35 mpg — but not until 2020. Our leaders’ idea of promoting alternative energy is touting future, non-existent technologies, and that false savior, ethanol. Ethanol consumes nearly as much fuel to make as it produces, while collaterally raising food prices and damaging the environment. The latest panacea is drilling in the Arctic and offshore, a short-term solution of dubious value that is wildly popular among oilmen and congressmen up for re-election, and in the Bush administration — which evidently hopes to use high gasoline prices as a wedge for opening off-limits areas to exploration for its Big Oil constituency. Meanwhile, Congress has failed to take the simple step of renewing federal tax credits for wind and solar power that will expire at year’s end. Every week of congressional foot-dragging on renewing the tax credits further dries up venture capital for critical solar and projects. Why is Congress deadlocked over this critical issue? How have our perceived options become so narrow and skewed? It is because without any public debate, a de facto U.S. energy policy has evolved and is now in place: to cling ever tighter to our oil-based economy and its lucrative profits for the scions of the status quo, and to marginalize all who are not on board with this. And now we are in the exact bind that Jimmy Carter tried to prevent three decades ago, when we were reeling from the concussive effects of oil supply disruptions in 1973 and 1979. Acting with promptness difficult to fathom today, our elected leaders then enacted year-around Daylight Savings Time, dropped the speed limit to 55, and established government price controls. And, oh so fleetingly, we downsized what we drove. All gone. Consequently, the United States last year imported 3.6 billion barrels of oil, three times the 1.2 million barrels imported in 1973. We not only are consuming record amounts of oil, we import nearly 60 percent of it, about 13 million barrels per day. In 1977, U.S. oil imports totaled 8.5 million barrels a day, or 46 percent of consumption. Remember, under Carter’s energy plan we were to hold the line at the 1977 oil import figure, in barrels. Had we done this, the percentage of U.S. oil imported today would be around 40 percent. Additional savings from Carter’s conservation and his alternative energy and synthetic fuel programs would surely have cut oil imports even further. But it happened so fast, we say. Today, change occurs at such blinding speeds that the rise and fall of technologies and nations happen in a single lifetime. An energy crisis is again upon us. Soaring gasoline prices and oil imports are daggers aimed at the heart of our stumbling economy. It is time to give Jimmy Carter’s proposals a second hearing. your article on Carter suggesting that if we had followed his advice we would not be in the situation we are today is so wrong. First, I like the first statement because that does suggest that we should of been drilling more as demand increased over the years to a point of producing half of the oil we used. However, living during those times and remembering Jimmy Carter he would of meant that we cut our usage to meet the 50% mark. His second suggestion that we put a major effort into alternatives was done, just maybe not to the degree needed. Those are both good statements. However, it is the rest of the suggestions that are very disagreeable to me. First " He was right in seeking to raise the fleet auto mileage standard to 48 miles per gallon by 1995. (Even U.S. automakers admitted at the time that they could easily achieve 30 mph by 1985.)" Putting requirements on auto manufactures increase the costs of those manufactures. Those costs are passed on to consumers. Additional costs by corporations are handled in two ways. Raise prices on what you are selling (causing the consumer to pay more for their car), settled for less profits (which shareholders will not like and that hurts everyone who has invested in them), or lay off workers (again hurts the consumer. Even with that not happening to the degree Carter wished, GM is close to selling themselves to foreign investors because they can not make it. So great idea lets give them more constraints. Next, " Invoking the pioneering spirit of the 1960s’ moon mission, he was right to recommend a tax on windfall oil profits to finance a crash program to develop affordable synthetic fuels." This was tried and there was a Windfall profits tax which during the time imposed was estimated to bring in an additional 300MM and ended up only bring in 85mm. Why because consumers with their good common sense stopped consuming as much because pricing was getting to high. Supply/Demand equation works when prices go up, demand goes down. economics 101. Next, Requiring Utilities to get 50% of their power from alternative sources." This is the best, Could you imagine what our utility bills would look like if that was done. WOW, that would of raised costs through the roof. You suggest in your article that wind power tax credits are slow to come about. MAybe that is because wind power is extremely inefficient. Read up on it. For this to be a viable solution, their has to be wind and lots of it. Then it would have to be stored for those many days there is no wind. There is currently no way to build an energy source large enough to hold that wind power so that it can be stored. So we would need fossil fuel, or oil in reserve to power what was not being consumed. Dont think that solves the problem. Getting tired of writing, but it makes sense to drill now and develop alternates now. As you rightly said ethanol is not the answer, that is just one side of congress who has their own agenda and the americans they serve are not their concern. Drilling in off-shore and the artic are sensible since it is a sure bet, contigencies should be giving credits to other sources so in time they can be proven to be useful as replacements, but in the mean time we are sure. New technologies allow for this to be done in a environmentally safe way. the fact that ALL of them were the conductors of Pax Americana policies, just a bit more or less aggressive. While in college in the early 70's I read a popular mechanics article on a great simple device to improve gas mileage on almost any vehicle. What a shame this happened only incrementally via a number of compromises between the auto co.'s and the government. The cars are cleaner tis true but there are so many more of them. The traffic is universally bad. I have taken to walking more. I will not relinquish my pickup truck I am a big man- but I use it selectively now. The road is less romantic for sure.I actually drive the speed limit! Of course, there are some liberals who would like to see industrial civilization grind to a halt. I think it was Paul Erhlich, who has been erroneously predicting for years that we would run out of resources, who said that a clean, cheap source of energy is like giving a child a machine gun. A stopped clock is right twice a day. Jimmy Carter may have been right once in four years. That oil is a finite asset controlled by unstable governments that may not have good relations with the United States was first expressed in my lifetime by President Eisenhower. This was in a speech announcing the “Atoms for Peace” program. Here, Jimmy said nothing new. Jimmy Carter and the congress let a bad movie set nuclear powered electrical generation back in this country by three decades. About all Carter did was establish DOE and talk. I would guess the number of kilowatts of electricity and the number of barrels of oil produced by the DOE is fairly small. Mike, can you enlighten me as to when Carter ever complained about the lack of human rights in Saudi Arabia or Iraq or the Persian Gulf oil princedoms?? Further, Mike, the US did have a lot of influence over events in Iran. See the article from about 1981 on this matter by George Lenczowski in the American Spectator. It's interesting that at the time of Khomeini's takeover, the Anerican press was complaining about the Shah's denial of civil rights, etc. All these denunciations of the Shah helped bring in Khomeini who showed the world what denial of rights really meant. I agree with Lawrence Hughes but would add one more peccadillo to carter's list. He and his man Friday, Zbigniew Brzezinski [now advising Sen Obama], got the US involved in fighting the Soviets in Afghanistan. The downside here was the kind of allies that Zbig and jimmy were working with. One of them was Osama bin Laden. After 9-11 Zbig was asked whether his doings in Afghanistan had been worth it in view of Bin Laden and 9-11. He answered Yes, pointing to the fall of the USSR. But his one-time proteges, bin Laden and Co. may be even more dangerous than the Communists were in their day. So much for carter's record on peace and human rights. "Sen. Daniel Patrick Moynihan summed it up when he said of Carter in 1980, 'Unable to distinguish between our friends and our enemies, he has essentially adopted our enemies' view of the world.'" I've looked for a source for this quote which is all over the web and haven't found one. I'm not interested in turning this thread away from Carter's energy program, but does anyone know the 1980 context for Moynihan's (if he did say this) statement. Here, here. Brazil just discovered two humongous oil fields in the Atlantic. Too bad we can drill in these areas off our own coast. Don't you love it when libs fight among themselves? And why don't you have the courage to mention nuclear power? I'm all for all forms of alternative energy that mention as well. But we we can't whitewash the fact that Carter promoted the safe use of nuclear power as well, although he was opposed to methods that involved the use of plutonium or recycling, which might encourage the proliferation of nuclear weapons. Before we turn him into a hero of solar/ethanol, let's remember that he did not discount the use of nuclear, which Carter's party now opposes today. If we had followed Carter's lead we would have been in much better position today. More solar and other alternate cleaner technologies and using less instead of more oil. We knew the car companies could have created more fuel efficient cars much less hybrids and electric only vehicles would have been much more in use and cheaper to run and purchase. Too bad our Bush/Cheney Axis of Evil are oil men who have no interest in getting off of that teat just yet. Drill, drill, drill! Even with many more dry wells these days and having to drill ever deeper to get oil at a higher cost. Sour crude that costs more to process also ads cost. Do the math. Brazil took a different direction though they still haven't gone to solar just yet. They need to and soon! There have been six or eight times since Rockefeller got started when the world thought it was running out of oil, and each time the geologists went out and quickly found lots more. This will happen again, although presently known reserves can fill current demand for perhaps 200 years at the present rate of consumption. Apart from that, your description of civilization coming to a schreeching halt without oil would be accurate. But there is plenty out there, and more atomic power will be generated to extend its life, too, plus gasification of coal. Relief from wind and solar sources will be too meager to make any difference. The extraction and use of more oil and gas is the only cost-effective and quick method of returning to a energy situation which does not threaten the end of the world. Global oil production is now declining, from 85 million barrels per day to 60 million barrels per day by 2015. At the same time demand will increase 14%. This is like a 45% drop in 7 years. No one can reverse this trend, nor can we conserve our way out of this catastrophe. Because the demand for oil is so high, it will always be higher than production; thus the depletion rate will continue until all recoverable oil is extracted. Carter's search for a new approach to energy production and consumption demonstrated his grasp of the fundamental challenges that would confront America in the future. Unfortunately, his successors since 1980 have succumbed to the allure of petroleum. Sniffing gas is an impediment to clear thought. Every president since Nixon has made that same claim in one form or another, and none have been demonstrated to be right yet. Our "dependence" on foreign petroleum will last as long as the Congress and the Greens want it to last and has absolutely nothing to do with the hallucinations of incompetent peanut farmers. Another issue that Carter raised was Human Rights, something that he was bashed over the head by the Wall Street Journal and others on the right. Seems that Bush used this issue as one of the justifications for invading Iraq. As for Carter and the Shah, how much influence did we really have over there at the end? have to agree with Lawrence Brooks. at a time when Carter is being made a fool of -- a willing useful idiot -- by Hamas, and writing books that are so riddled with errors that they would never get a passing grade from a serious professor, it seems bizarre to say the least to read an article with this title. surely one can find a voice for sanity in energy conservation and independence other than Carter. Admirers of President Jimmy Carter have got to be an endangered species. Most of us feel he was a terrible president, and perhaps THE worst ex-president, as well. Carter failed to deregulate oil and gas, and we had to wait four years until Ronald Reagan did so, making fuel supplies rise and fuel prices fall. Carter undermined the Palavi government in Teheran, leading directly to the ascension of the madman Khomeini, which in turn led directly to our present problems with Iran, not to mention the hostage crisis, the enslavement of Iranian women, and the Iran-Iraq War. Carter said the income tax was "a disgrace to the human race," but did nothing about it. It's still the same, 27 years after his term ended. He said the military had more generals and admirals than during World War II, and it still does. He believed in turning the other cheek toward the Soviet Union, instead of pubhing back as Reagan did, which prolonged the Cold War. He may have been right on the narrow issue of auto fuel standards, but this is the man who gave us a prime rate in the high teens, sky-high unemployment, and a misery index in the 20's. Carter managed to do a gread deal of damage to the U.S. in four short years, and a whole lot more damage since.